Don't miss the electrifying second book in the must-listen trilogy of the year! With death only a heartbeat away, Gene and the remaining humans must find a way to survive long enough to escape the hungry predators chasing them through the night. But they're not the only things following Gene. He's haunted by Ashley June who he left behind, and his burgeoning feelings for Sissy, the human girl at his side. Their escape takes them to a refuge of humans living high in the mountains. Gene and his friends think they're finally safe, but not everything here is as it seems. And before long, Gene must ask himself if the new world they've entered is just as evil as the one they left behind. As their enemies close in on them and push Gene and Sissy closer, one thing becomes painfully clear: all they have is each other...if they can stay alive. 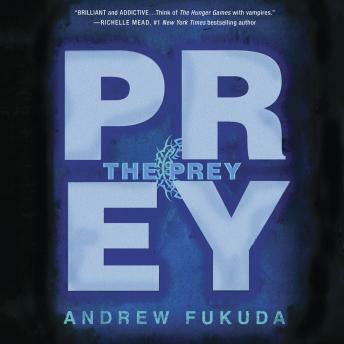 Chilling, inventive, and electrifying, The Prey is the second book in Andrew Fukuda's The Hunt series. The book is great! It is probably the best series I have ever read and I can not wait to listen to the next book. Although the person reading the the book is loud and clear but he reads a little slow.